Calendar Bike Building Championship - Featuring 2 Events This Year! 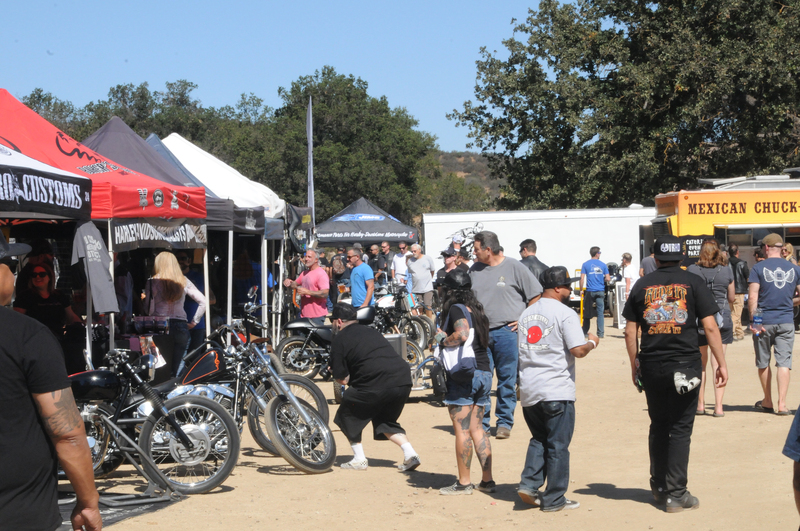 The 2017 LA Calendar Motorcycle Show continued its now 27-year tradition as the premier outdoor street bike event in America at two exciting dates and venues this year. Each Event featured top Celebrity Custom Bikes & Builders, selected Vendors and Exhibitors, Live Music performances. And the world premier of next year's new 2018 FastDates.com Motorcycle PinUp Calendars featuring the world's top Sport and Custom Motorcycles with the beautiful Calendar Kittens in attendance at the Show. The best Builders and their Bikes were invited to be photographed by producer Jim Gianatsis for the next FastDates.com Calendars. 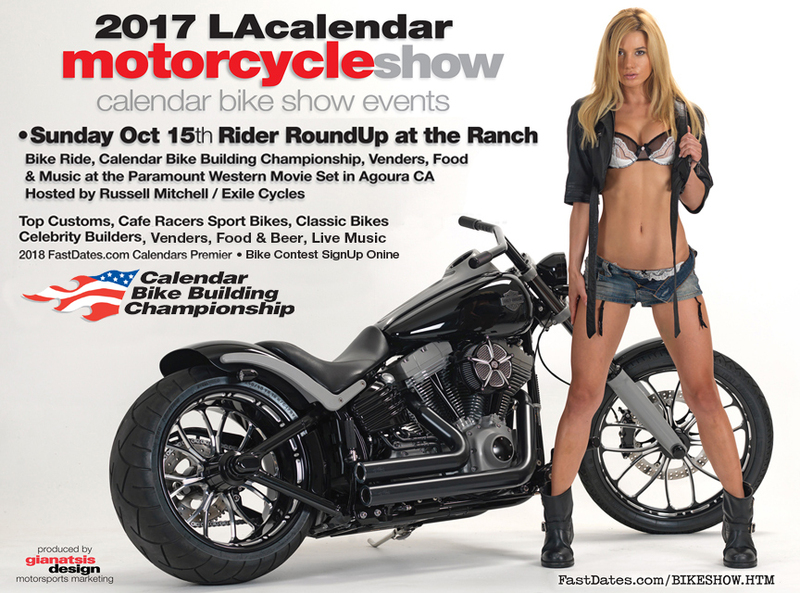 The 2017 LA Calendar Motorcycle Shows celebrates the premier of the new 2018 FastDates.com Calendars including Iron & Lace with the winning bike sof the 2106 LA Calendar Motorcycle Show's Calendar Bike Building Championship. Click To Order the New Calendars Here! Calendar Kitten Corle and Max Hazam's Show Winner! 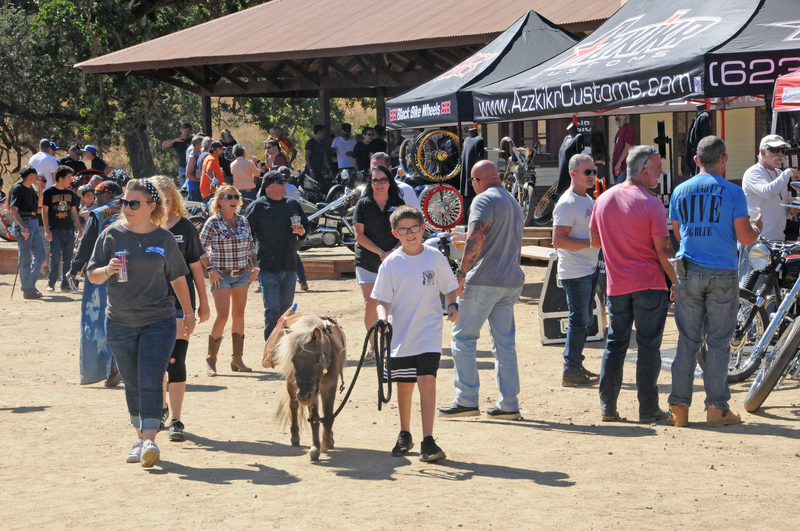 Paramount Movie Ranch State Park, Agoura, CA, October 15th, 2017 - Our Calendar Bike Building Championship joined the Rider RoundUp at the Ranch produced by celebrity Calendar Bike builder Russell Mitchell and wife Rachel / Exile Cycles at the Paramount Western Movie Ranch in Agoura, CA, just down the road from the legendary Southern California biker hangout The Rock Store on Mulholland Highway. 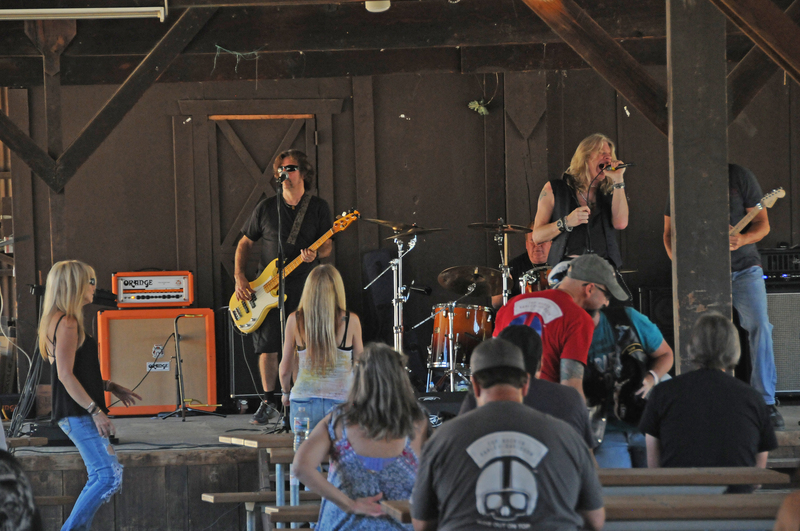 It was an exciting day of beautiful Custom Motorcycles, Activities, great tasting Food Truck, BBQ and Craft Beer, Venders, Manufacturers and Live Music. The Rider Round Up at the Ranch was the second year celebration of Exile Cycles’ 20th Anniversary Party held at Paramount Ranch the year before, now continuing on an annual basis. 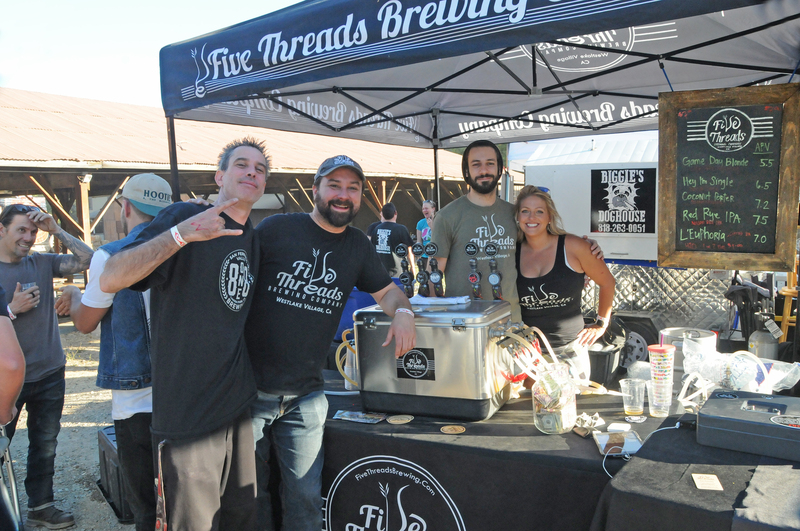 And again it was a benefit to raise money to Fight Leukemia by auctioning off products and services, together with money donated by the Vendors and Sponsors, this year raising $7000 for the Cause. 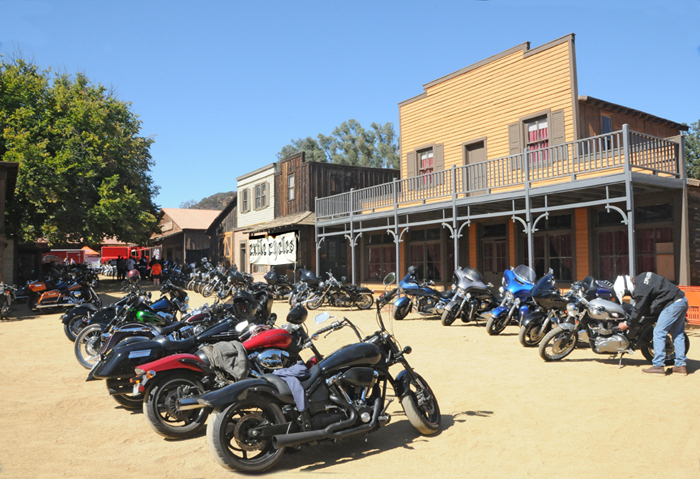 The famous Paramount Ranch movie location is a fun place to hold a bike show, with spectators being able to ride their bikes and park in the streets of the old western town. For movie and TV Buffs, Paramount Ranch was first owned and built by Paramount Movie Studios as a western town movie set back in the 1923 for the then popular western movies. In the 1960’s a paved sports car road racing track was built on the land and held races for a few years. More recently the location was the set for the popular 90s TV Series of the Dr. Quinn, Medicine Woman. A train station was built in the western town for Dr, Quinn, including the laying of real train tracks and the installation of a live running steam locomotive with cars which operated back and forth across the set. When the Dr. Quinn TV series ended the entire Paramount Ranch including the western town movie set was given to the U.S. Park System for public use, with the condition it could still be used for filming and special events. Most recently the western set was used it the HBO TV series West World. FastDates.com Calendar Kitten Corle welcomes us to the Calendar Bike Building Championship at the old Western Town Train Station. 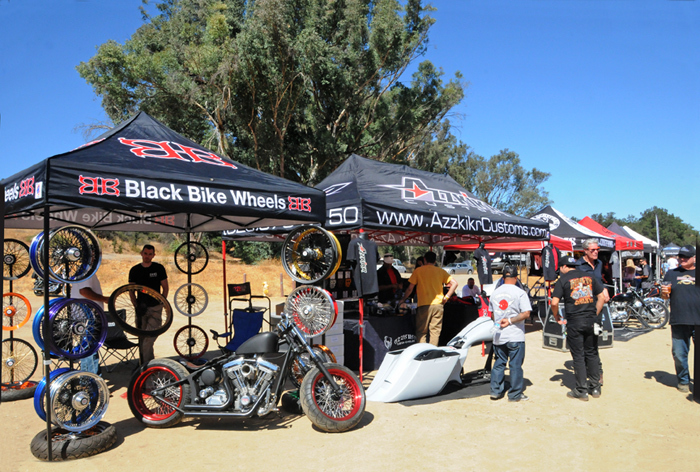 The lowered Red / White Bagger on the right is the Azkziker which placed a close 2nd in Street Custom. FastDates.com Calendar Kitten Corle with David Bird's / DavidBirdHardtails.com 2nd Place Triump Bar Hopper. 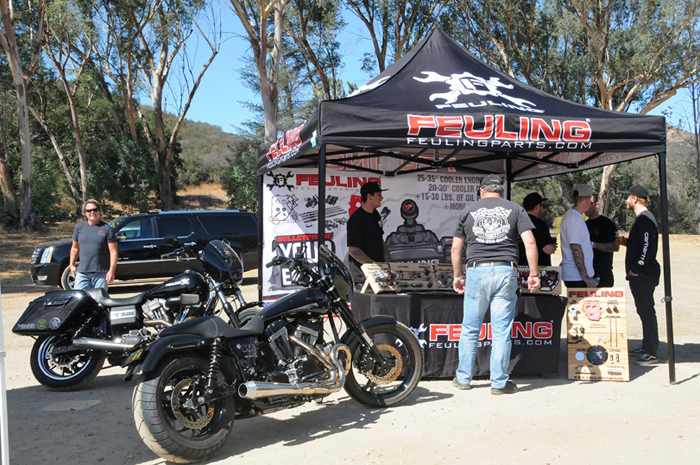 The Train Station Platform was the location for this year’s Calendar Bike Building Championship, the custom motorcycle contest franchise feature of the LA Calendar Motorcycle Show producer by FastDates.com Calendar photographer Jim Gianatsis. Assisting Jim in producing this year’s bike contest was Calendar Kitten Corle Bunch, who ran the morning’s Contest Registration, posed for the bike owners and spectators for photos, and assisted Russell Mitchell and Jim with the authenic Mikuni Carburetor Trophies at the end of the day in the shaded concert and dining area. 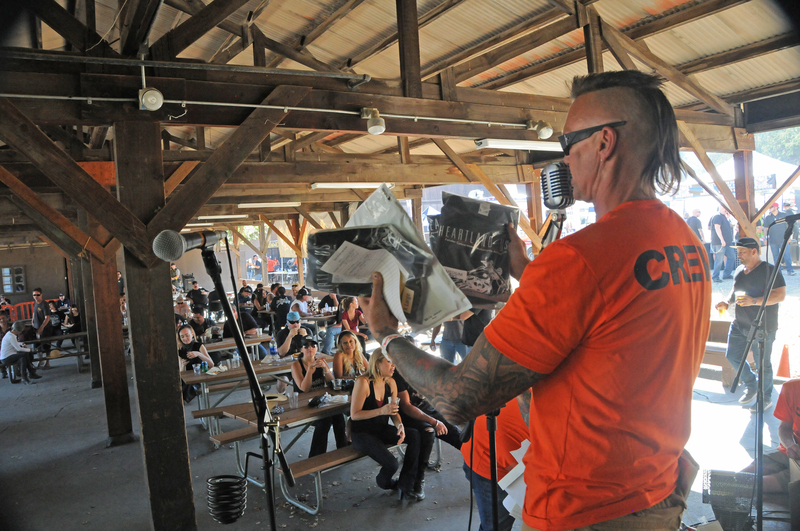 Russell auctioned off swag in the shaded band/ dining area to help pull in $7000 to donate to the Leukemia Society. Spectator bikes got to park their bikes in the middle of the old Western Town Set at Paramunt Ranch. 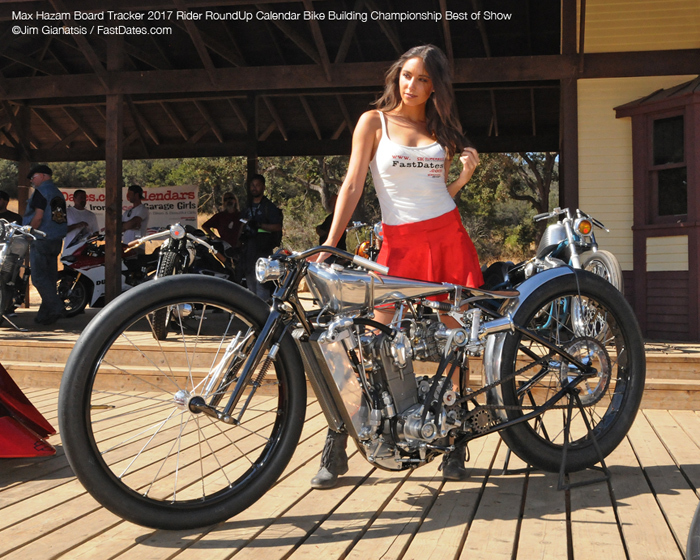 Taking Best of Show at the 2017 Rider RoundUp Calendar Bike Building Championship was Max Hazan's hand crafted Supercharged KTM Single Cafe Racer. Max, who has a storefront custom bike shop in Venice Beach, CA, built this latest customer consigned bike bike from scratch around a 420cc KTM / Husqvarna 4-stroke single cylinder dirt bike engine. Max fabricated a belt drive system off the engine's crankshaft to run a mini dual rotor Supercharger fed by a Keihin FCR39 Racing Carburetor. The KTM single's steel tube rigid frame chases hosing the water-cooled motor was built around 26-inch classic car tires with custom built spoked wheels. The tiny rear disc brake located behind the rider's right foot, operates a shaft through the frame with a fixed primary sprocket on the other side, engaged with the drive chain, to slow the rear wheel down when the foot bake is pressed. Very original! The hand made springer front forks with hydraulic damping and a front headlight that turns with the steering stem is also unique. The bike is finished off with a beautiful had made aluminum fuel tank, handlebars and many other components. It was unanimous by anyone who saw it, that Max’s Supercharged KTM Board Track Racer Replica was the Show winner, one of the Calendar Bike Building Championship’s best ever builds in its 26 year history. Garnering Judge’s Special Mention in this year’s 2017 Championship was 2016 Best of Show winner Yuichiti Yoshizkwa,/ Custom Works Zon / cw-zon.com who again flew in again from Japan with his complete build crew and their newest custom bikenamed “Zonkern”. The Sportser powered sport bike featured a highly intricate aluminum tube frame with a Ducati Superbike single side rear swingarm, and full hand fabricated aluminum gas tank and bodywork. 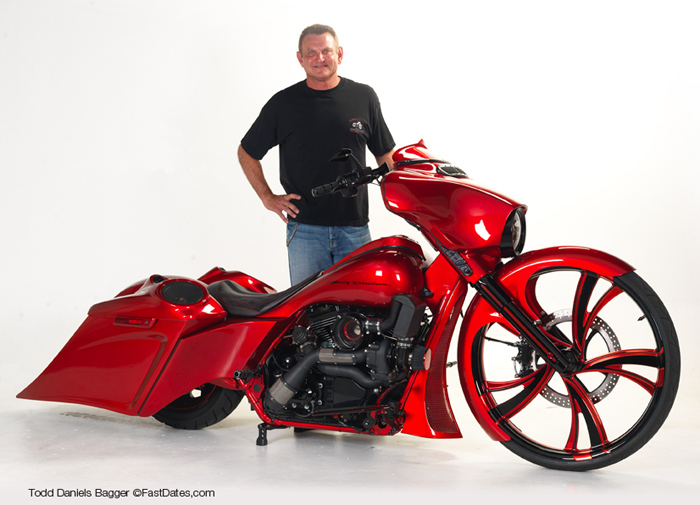 Todd Daniel's beautiful Candy Apple Red Tutbocharged Bagger won Street Custom. The Calendar Bike Building Championship Championship Class Winners included Todd Daniel in Street Custom with his beautiful Turbocharged Red Bagger which premiered at our Calendar Bike Builder’s Party back in July where it was photographed for the next Iron & Lace Calendar. Also premiering back in July at the Builder’s party and also photographed for the Calendar was Richard Jones’ Sportster powered British replica custom, now taking the Classic American class. 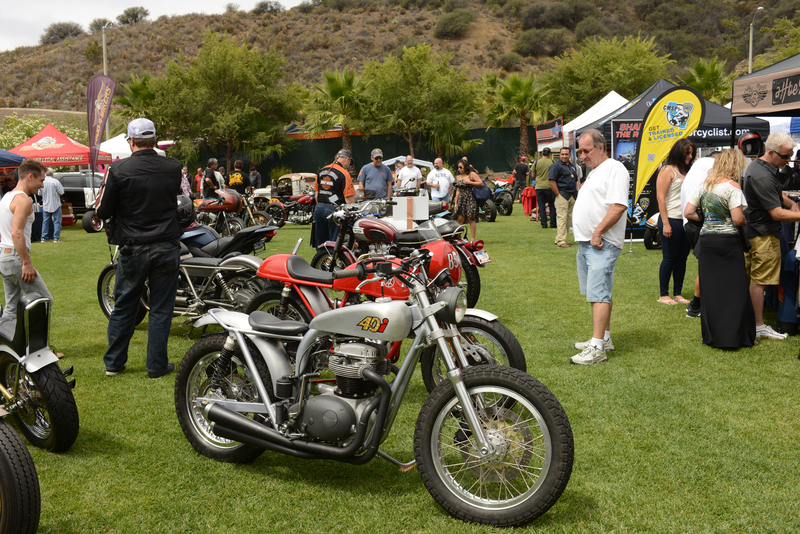 The Bar Hopper / Bobber Class was dominated by classic Triumph Twins from the ‘60s, with Anthony Robinson entering two Meriden bikes, and taking first place with the most unique which had the cylinder head reversed so the carburetors faced forward, and the exhausts ran straight out of the back of the heads. Sara and Brittni with Richard Jones' newest custom, a retro British themed cafe racer with a springer front end and a modern Harley Evo engine. Richard is not a professional builder, and this was just his 2d ever build for his own collection. His first custom build was an aluminum framed Harley custom which won the Street Custom Class at the 2015 LA Calendar Motorcycle Show and is featured in the 2018 Iron & Lace Calendar. 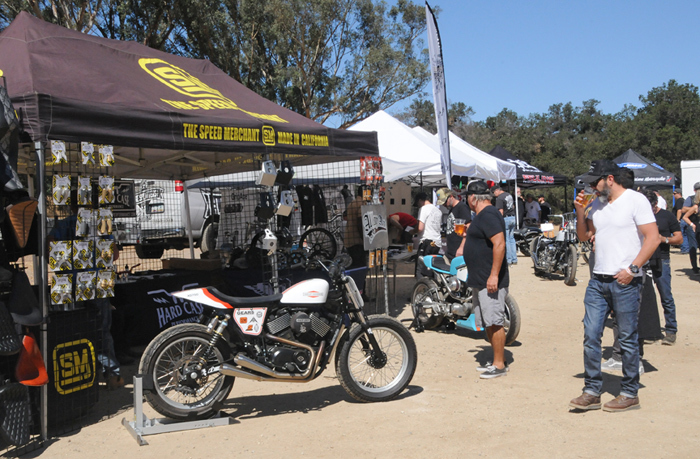 Best of Show: Max Hazan's Supercharged KTM Single Cafe Racer. Street Custom: 1. 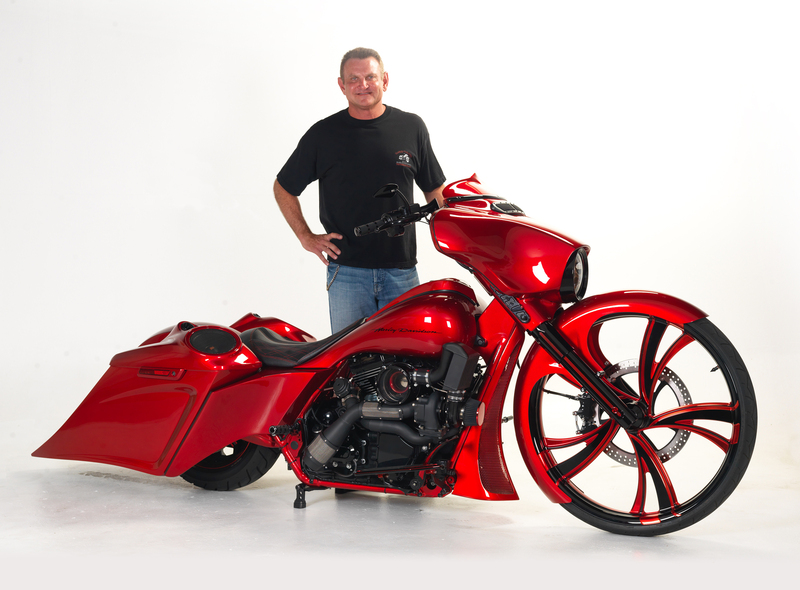 Todd Daniel Red Turbo Bagger; 2. John Meade / Azzkikr Custom Bagger. 2. David Bird, Triumph Bobber; 3. Anthony Robinson Triumph Bobber. 2. Spike's custom Harley; 3. Richard Jones aluminum frame Big Twin / 2016 Show Class winner. 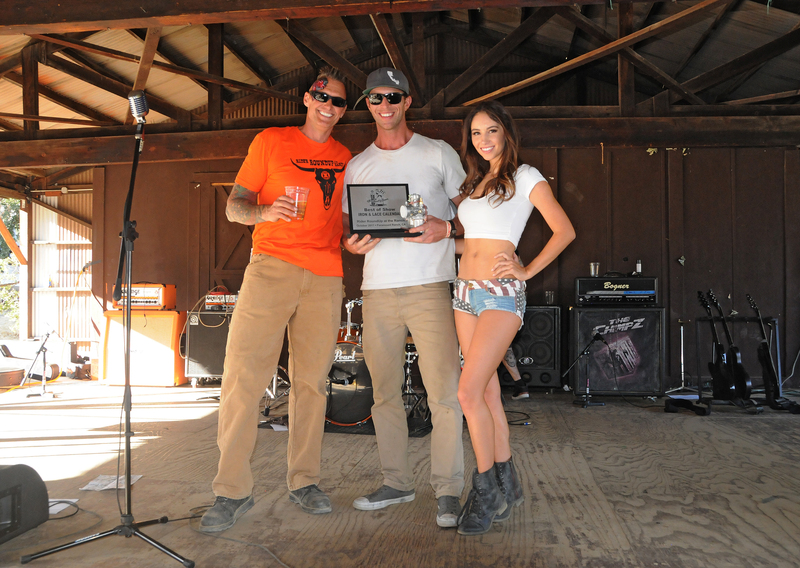 Russell Mitchell and FastDates.com Calendar Kitte Corle award Max Hazan the Calendar Bike Building Championship Best of Show Mikuni Carburetor Trophy. Five Threads Brewing Company from Westlake Village offered up five ice cold tasty micro brews on tap! Two different rock bands performed thtought the day. 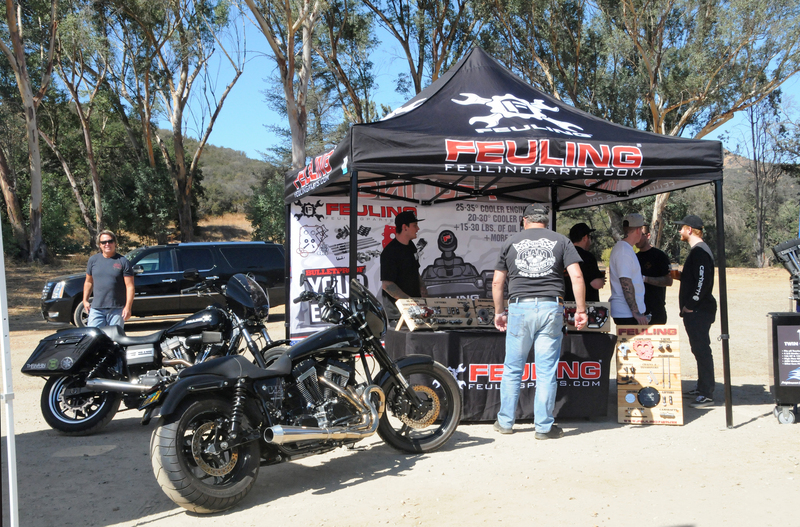 Fueling's Vendor display featured their jaw draw dropping 3-cylinder Evo Street Custom. 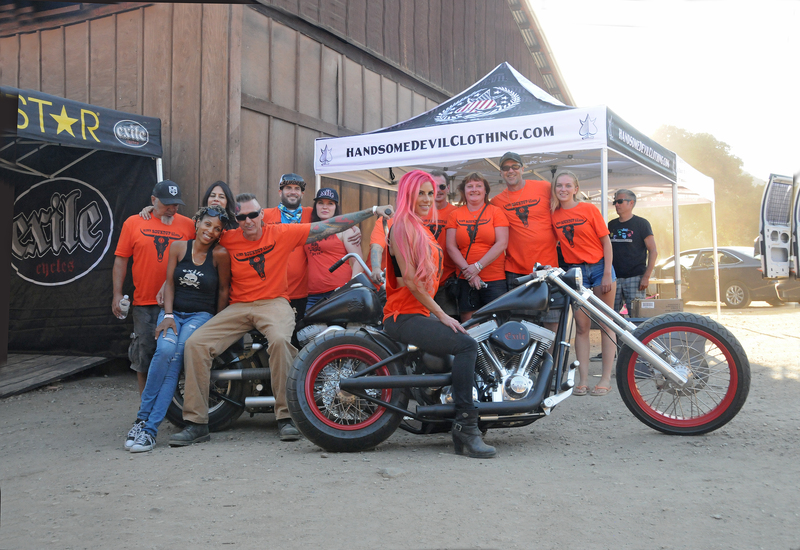 Russell (Mohawk and shades) and Rachel Mitchell (pink hair on the chopper) with their Exile Krew of Volunteers who worked hard to put on a great event and raised $7000 to help fight Leukemia. Thanks Guys and Gals!